The open access publishing model was initially based on the notion that a single payment from an author or an author’s funder just prior to an article’s publication could allow for ongoing no-cost access. A major assumption in the business model was that marginal costs for electronic distribution approached zero (over above repaying the publisher for editing, peer-review administration, and composition), so a price that absorbed what would be less than a rounding error should prove sufficient. Under the initial model, an author or funder paying a few hundred dollars a few months before an article was published was covering the expenses of editorial processing, composition, XML conversion, and other costs involved in creating the article, as well as hosting fees. It was essentially a reimbursement to the copy editor, managing editor, composition staff, etc. Because the marginal cost of online publication was posited as virtually zero, the open access model could presume that once the costs of article production were paid, the article could be purveyed online at virtually no cost. Essentially, if the model had worked from inception, there would have been no need to modify it. But things have changed, and the initial model requires supplemental revenues to achieve its goals. After all, the financial model was created before concepts like the long-tail were commonly acknowledged; during a time when the desktop computer was the main interface to information; and prior to the interactivity expectations that arrived with Web 2.0. Once an article is created and published, do the expenses end? In the print world, they pretty much did. In the digital age, they most certainly do not. Even if coal were mined and distributed free to electric generating plants today, the reduction in your monthly electricity bill would amount to but twenty per cent, so great is the cost of the plant itself and the distribution system. The premise that now distribution is virtually free gets it wrong in the exact opposite way. The problem now is that information production is becoming more expensive as more value has to be added upstream by publishers in the digital age; that same value has to be maintained and enhanced for a longer period and constantly; and that same value has to be migrated to an increasingly diverse and demanding digital infrastructure. The likelihood that fixed costs — editorial salaries, internal systems, and software licenses in the small scale; redesigns, content migrations, and device support in the large scale — will only increase for digital publishers is driving expenses in much the same way interest charges drive the cost of a loan. Over time, the costs add up. If you’ve ever taken out a mortgage or refinanced, you know that statement lenders are required to give you — the total cost calculation, how much you’re actually going to pay in principle and interest. It’s always a soul-wrenching moment when you see it, but it’s reality for interest-bearing loans, one that’s analogous to growing, dynamic, expense-laden online publishing programs. The full cost of sustaining, migrating, enriching, propagating, and storing any article is going to grow over a 30-year period. Just think how much you spend now on your digital platforms, staff, and systems compared to 10 years ago. You see the reality we’re entering. This reality applies to traditional publishers as well, especially those levying color and page charges. Paying a little up-front may defray some costs, but the timeframes and expectations of content publishing have changed. For established publishers, cross-subsidization of online publishing’s fixed costs flowed relatively easily from ongoing operations. Established publishers could borrow staff from what had been a purely print operation; draw from print revenues (advertising, reprints) to make up the gap online publishing expenses created; or create new revenue sources that, while small, proved sufficient to cover the relatively small costs initially allocated to online publishing. Open access publishers had no established revenues to rely on, beyond a few major grants like those that started the Public Library of Science. Also, OA publishers are essentially digital-born publishers, with little or no print legacy or infrastructure. So, it’s no surprise that the OA model has quickly gone beyond article-level payments. As analyst Eric Shafelt recently said, “If you were an online startup, with the added bonus of having all of the assets that your publishing business has, how would you build a business online?” More dramatically, what if you were really an online startup like most OA publishers? How would you adapt to online publishing realities? This is why looking at the changes in OA financing can be instructive. Now is the time for research institutions (including libraries) to establish new fund flows in support of open-access publishing. . . . We believe that institutions (and the sub-institutional units that manage collection funds) should be open to exploring alternative funding models for scholarly communication. PLoS’ institutional memberships are worth contemplating from a financial perspective, because their construction contains a fair amount of risk. Under the PLoS institutional model, each member institution is able to offer its faculty discounted publication fees at PLoS, apparently a discount of 50%. This discounting affects revenues unpredictably from PLoS’ perspective. Sometimes, an institution will publish a lot of discounted papers during a year, other times only a few or maybe none. That unpredictability could be a virtue or a burden on the books — it’s unpredictable. Because many member institutions are large, it only takes 3-5 discounted papers ($2,250-3,750 in total discounts) to more than cancel out the revenues associated with an institutional membership. This is a risky financial proposition for PLoS, but they have to offer institutions a clear incentive for membership, and a reduction of author fees is a natural extension of their main value proposition. They can’t charge for access after publication, so they have to charge for access to their pre-publication services. PLoS isn’t alone in this approach, and actually has a less risky approach than other OA publishers. For example, Hindawi Publishing has much lower per-article charges and institutional membership pricing based on research output (you have to get a quote from Hindawi to know your charges). However, the riskier aspect for Hindawi is the fact that authors at member institutions can publish at no cost. Now, I can’t gauge the risk since I’d have to get a quote from Hindawi to know how much an institution would stake against the potential lost revenue or expense, but knowing how institutional pricing hews to a community standard, I can’t imagine it being any more than an average site license. So, on a per-institution basis, it can’t be more than a few thousand dollars. That’s a handful of papers on average for Hindawi, so I think the risk is pretty high. The “debt” incurred with the copy editors, compositors, etc., has to be paid from these membership fees, which might be exhausted at some point. The fixed costs of digital publishing are something I’ve argued need to come front and center for today’s publishers. We’re becoming much more like service providers and software companies than manufacturing companies, and our financial models need to change accordingly. It’s pretty clear that the OA movement’s basic premise was based on how digital publishing rearranged some manufacturing assumptions (once the production costs are paid, distribution is free). The problem is that the initial model didn’t account for the new service and software expectations. What they didn’t know at the time was that the long-tail, Web 2.0, and device proliferation would all come to alter expectations and create new layers of online publication costs. First, we intend to expand the number of third parties from whom we receive data; over time, we will add these sources to each article. The next phase of development will be to provide filtering and sorting tools to allow users to navigate our content using these metrics. We also hope to provide tools to allow users to analyze the metrics on their own behalf. PLoS is like many other publishers learning the lessons of online expenses, with interactive curation and publicity of its content requiring talented people you have to pay. Again, nothing unusual, but definitely something that increases the marginal cost of online publishing. From a revenue standpoint, PLoS has recently added Individual Memberships. How these work isn’t entirely clear to me. They seem like donations, but I can’t tell if they’re intended to be annual donations, one-time donations, or if PLoS just hasn’t quite thought this through. In any event, the value exchange is simple — donate, get some swag, and have your name listed on the PLoS site as a donor at a certain nicely named level. How lucrative this new membership level proves remains to be seen, but NPR and others certainly make it work. My observation is that the changes dictated by online publishing are creating a new financial reality for publishers of all types, OA publishers most obviously. The financial realities of online publishing will require continued modifications to the OA business model, some of which are force-fits into the basic OA premise, and some of which carry some sizable risks. Also, in a broader sense, thinking anew about the fundamental economic bargain of OA publishing — that authors pay a debt to the publisher upon publication — may reveal this manufacturing-era conceit as unsustainable. So, for the ideal of open access publishing to be maintained, a different path may need to be found if OA publishers are to flourish in an era of increased, long-term fixed costs. Like a mortgage, the author’s down payment is really only the beginning of a much larger commitment. 19 Thoughts on "Why the Open Access Financial Model Will Continue to Transmogrify"
Thank you – really informative and clearly argued! Emphasis on the the fixed costs of digital publishing seems to me much needed. I don’t disagree with the assertion that digital publishing has ongoing costs that are not always taken into account (for both toll-access and open access publishers), but I take exception to the history of the OA business model sketched here. The “author-pays” model of PLOS, BioMedCentral, and Hindawi among others is only one OA model and not the first. The most prominent models in OA discussions are the so-called Green and Gold models, which rely on the toll-access industry to cover fixed costs. Other models call for support through advertising, the development of premium or “overlay” services, outright institutional sponsorship, or the creation of a new tax regime to fund the services. OA, like other forms of publishing, has multiple approaches, some of which generate more income than others. The total cost of lifecycle publishing grows out of the nature of digital publishing and not from the author-pays OA model. I chose my examples to illustrate two cases in which the models have shifted, and will likely continue to shift. Commercial, high-profile OA publishers are what I chose to focus on. I could have been clearer. I wanted to focus on two prominent organizations that have recently shifted their initial business models, to illustrate that this is a natural part of adjusting to a shift in the publishing model that’s larger than OA — that is, digital publishing — and that some of the initial assumptions came from a manufacturing frame of mind (e.g., marginal costs). Indeed, you could have been clearer. Your title speaks of “‘the’ Open Access Financial Model…”. However, there is not one single financial model in the Open Access world; there are many, including the institutional support of institutional and discipline-based repositories, which you ignore entirely. Your text deals only with the few publishers that use the so-called “author-pay model”. Once again, this is but a small fraction of Open Access, and even of the so-called “Gold Road”. In short, your title is quite misleading and your conclusions have but very limited value. OK, I was with you until that last phrase “conclusions have but very limited value.” Care to elaborate about an OA model that is perfectly tuned to digital publishing realities? The point of this post was to show that there is a superordinate financial model change affecting any publishing model. So, while I picked out commercial OA publishers using the author-pays model (primarily, but no longer solely, and there’s likely no going back), let’s see if my conclusions apply to your other models. Do you think that institutional support of OA publishing properly accounted for ongoing archival, migration, device-support, long-tail, interaction, UI, UX, and curation costs? Or were they established under the premise that marginal publication costs approach zero so these things are cheap to start? Well, then my conclusion has a lot of relevance. Same for “discipline-based repositories” such as arXiv, which had to move to another campus, toyed with a subscription model, etc., because its initial financial model assumptions proved untenable. Some lateral thinking is all it takes to see that any publishing model predicated on the notion that online is so cheap to run that you don’t need a big budget is probably misguided, especially now that a robust digital publishing ecosystem is emerging. I think you should ponder the implications of assuming that any OA model has a viable financial model under current conditions. There’s more going on, and everyone’s going to have to adapt and adjust. Kent, can you add some discussion of continuing digital preservation costs? Sure, I’ll try. I think there’s preservation on one end of the spectrum (a relatively passive approach, probably compounded by some backup and storage costs to ensure duplicate copies in case of disaster recovery needs), migration in the middle of the spectrum (a semi-active approach that includes preservation but the archive is carried forward with complete functionality so that a continuum of content and services exists with expenses coming in big chunks atop the ongoing preservation costs), and curation at the far end of the spectrum (an active approach that includes the prior two approaches along with some active highlighting, discovery assistance, linkage, packaging, etc., of archival content). From an expense perspective, preservation ain’t cheap if you have low risk-tolerance (i.e., need a robust disaster recovery solution), and could be risky if you cut corners; migration means repeated reloading of older content to suit new places in the digital ecosystem and integration of new services; and curation means really working older content as an asset, and I would hope have some revenue upside. I think there are some hidden preservation costs customers don’t see, such as preserving different versions (PDF, XML, HTML, ePub), internal CMS migrations that don’t affect the UI but are part of doing business, and upgrades to better technical environments for various reasons. Does that get to what you were after? Kent – I’d like to clarify a couple of points in your post. First the institutional membership program at PLoS is associated with a 10% publication fee discount. We calculate the fee for membership according to the projected publishing volume at the particular institution. 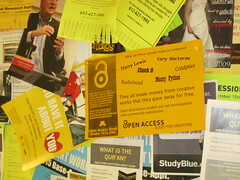 This program helps to support PLoS’s work around OA Week (www.openaccessweek.org), attendance of certain library events, and in general is extremely valuable in terms of relationship building with institutions who want to support open access publishing. However, we don’t view institutional memberships as a way to provide revenue for OA publishers in the long-term. Instead, we feel that the efforts being made by institutions such as UC Berkeley, who have developed centralized funds to support publication fees charged by some OA journals (as described in the article you quote from), have great potential to support open access publishing – especially for authors who might not be very well funded. As far as individual memberships are concerned, this is a fairly small program right now at PLoS which has been in existence for several years, but is an area where we see some potential for growth. Finally, on the subject of the publication fees themselves, we didn’t raise them this year – http://blogs.plos.org/plos/2010/07/plos-publication-fees-held-for-2010-2011/. Mark, thanks for the clarifications. I looked at PLoS’ institutional benefits PDF, and it gives the distinct impression that the discount is 50% (says standard rate is $1,500, but shows an institutional rate of $750 if that option applies). As far as how you use the money and how you think about it as a source of revenue, it’s money you get and spend, so it’s operating revenue. Fee pools are fine, and part of the transformation I mention in the post. I’m not against the changes, just noting that there’s nothing predestined or certain about the model, especially given some of the emerging financial obligations of digital publishing. And yes, a lot of publishers held rates this year, so I’m not surprised you did as well. But you raised them in previous years, and you state “we cannot guarantee that we will not need to raise publication fees in the future” in the document you link to. Again, not a bad or unreasonable thing, but it’s clear that the initial rates weren’t sufficient, and you’ll need to keep dialing in author fees, supplementing with other revenue sources, etc. As I said in the post, it’s part of our new, shared reality as digital publishers. Thanks for pointing out that document on PLoS Institutional Memberships. The information it contains is over five years old, and it needs to be updated – I should apologize for not keeping this information up to date. We will fix that promptly. Certainly, our institutional membership program has been adjusted over the years and the discount has been set at 10% for some time. To reiterate the point, we don’t see this program ever providing a major revenue stream for PLoS, but we do see institutions having an increasingly important role in supporting open access publishing more generally, for example through centralized funds to support open access publication fees. I have a few questions and comments. 1) Aren’t some of the costs (like preservation) being displaced to other agencies like Porteus and CLOCKSS? 2) I’ve asked Hindawi on liblicense what the effect of its author-pays model is on authors when the increase in submissions adds costs to the system for processing that are not offset by any submissions fee? Why should authors whose articles are accepted have to pay more to support the increased submission of unpublishable articles? Or is there a temptation here for Hindawi to increase acceptances proportionately to cover the increased processing costs? 3) The OA model for monograph publishing so far has been quite different. As far as I know, author-pay models have not arisen in that sector, but instead publishers have hoped to support OA through sales of POD and PDF versions. For a press that does not have a strong print backlist, or other sources of income, this seems a very risky strategy, as Rice U.P.’s failure seems to have demonstrated. It’s Portico, not Proteus. I don’t know the economic model for CLOCKSS, but for Portico, the publisher pays a fee to deposit material into the dark archive, and libraries pay a fee to have access to the archive in the event of a disruptive change in the environment. Thanks for catching that. I couldn’t find “Porteus” anywhere, and thought I’d missed a meeting. CLOCKSS and Portico have a similar model, but I think CLOCKSS depends entirely on publisher fees. But I could be wrong about that. Wonderful thread! The costs of digital preservation is a hot topic, experience says content ingest is the biggest single cost. The CLOCKSS archive keeps preservation costs very low [http://www.clockss.org/clockss/Contribute_to_CLOCKSS] by using infrastructure that already exists for governance [http://www.clockss.org/clockss/Board_of_directors], for preservation actions [the LOCKSS Software],and for safe keeping of the content [12 “archive nodes”, major research libraries around the globe]. CLOCKSS does not charge libraries a leasing fee for access. The content is not available for librarians or readers to use until it’s “triggered”and then it is made freely available to everyone http://www.clockss.org/clockss/Triggered_Content. Triggered content is defined as content that’s no longer available from any publisher. CLOCKSS can return the preserved content to a publisher if they suffer a calamity. Anyone who is interested in more details is welcome to contact me. Preservation concerns can be addressed by CLOCKSS, but that’s more of a recovery system in the case of a calamity, not a preservation system per se, at least in my mind. It’s not like a publisher can store content in CLOCKSS, not have it live on a site, then retrieve it from CLOCKSS, at least as far as I understand the architecture. Not sure about Porteus, I have to admit. But given the level of integration and service that’s becoming the norm in the age of the long-tail and interactive, deep media, I wonder if it’s wise to punt the archive. The cost of rejections is another factor that’s often not accounted for. Journals with very low acceptance rates have to spread revenues over a huge swath of rejections. With more scientists, easier submission processes (thanks to online systems), and more papers, expenses for rejections are increasing everywhere. Don’t know if Hindawi is tempted to accept more to offset costs, but that’s a distinct possibility in an author-pays model. PLoS depends on the revenues from PLoSONE quite a bit, and it has a 70% acceptance rate. The author-pays model incents acceptance. The failure of Rice University Press is probably instructive, and others are teetering. It’s great to see rational discussion of scholarly publishing costs! It is clear that ongoing costs of article distribution are not zero. Less clear is who will pay those costs, how they will be compensated, and how they will be bundled with other services? Do Institutional Repositories (IRs) represent willingness by academic institutions to shoulder perpetual distribution costs? Is Google willing to pay new platform conversion costs in order to sell advertising on those platforms? Etc. Seems like distribution costs/rewards might become unbundled from the traditional publishing package. Kent, thanks a lot for having a closer look at distribution costs, or should we say post-publication costs? I would like to make two points. Subscription journals obviously have a different cost calculation, but the issues you discuss are relevant for them as well. And just as post-publication costs should probably be looked at separately, I would like to see more discussion about submission costs. Manuscripts not accepted for publication obviously cost time and money, and these costs currently are covered indirectly. I completely agree. I hope I made it clear that these costs are applicable to all publishers. There’s a new economic reality driving decisions for all digital publishers, and it revolves around moving from first-copy and run-on costs and toward content creation, curation, and preservation costs tied with services and interactive environments. Yes, rejecting papers costs money. With the majority of papers ultimately published, one related question is about brand silos. Rejections are a local phenomenon, not a system phenomenon, and branding is the major bit accomplished.